Today everyone is on a strict budget, making home remodeling a much more difficult task than in the past. Fortunately it is still possible to give your bathroom a makeover without going over your budget with just a few small steps. Remodeling does not have to mean tearing down the entire bathroom and starting from scratch, there are many other things you can do to make your bathroom look brand new. These changes will have a large impact on your bathroom with a small impact on your wallet. Make sure to begin with any structural damage that is apparent in your bathroom. When you search for structural damage in your bathroom, look for things like old, rusty pipes or rotted or moldy walls. These types of repairs typically require professional help and will take a majority of your bathroom remodeling budget. Knowing if any major structural repairs need to be done can help you budget for the rest of your bathroom. Cosmetic damage will vary, it could be chipped paint on the walls, lighting that is outdated or does not work, a vanity that is outdated or not functional as well as a wide range of other cosmetic issues. Cosmetic damage can typically be repaired on your own, saving you a great deal of money, making it possible to do more remodeling for less. 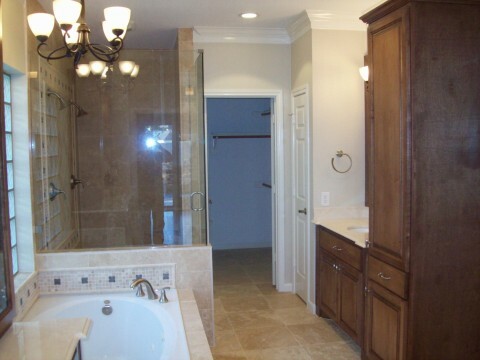 The best way to remodel your bathroom when you are on a budget is to figure out what you can remodel on your own. There are little changes you can make such as changing the toilet seat cover, changing the pictures on the wall and adding a vase of flowers on the table to name a few. There are also more dramatic changes you can make such as changing the color of the paint on the walls. Simply adding a fresh coat of paint to the walls and maybe a few framed pictures can make a huge difference in the look of your bathroom. If your vanity is outdated or you simply do not care for it anymore, it is possible to refurbish it on your own. With a few simple tools such as sandpaper, paint and polyurethane you can transform your old vanity into a vanity that looks brand new and gives your bathroom a whole new vibe. If your shower caulking is old or moldy, you can simply rip the old caulk out and replace it with new shiny caulk. This is an easy do-it-yourself trick for your bathroom that will have your shower looking shiny and new. To put the finishing touches on your new shiny shower, add a new shower curtain and liner and you will have a shower that looks brand new. Another quick fix for any bathroom is to replace the mirror. There are a wide variety of mirrors available at home improvement stores, discount department stores and even resale shops. Find the perfect mirror for your bathroom and replace the old existing mirror. You will not believe the dramatic difference that a mirror can take. Once you have made all of these bigger changes, you can add new bath rugs, new towels as well as little things like a new soap dish and your bathroom will have a whole new look for very little money.